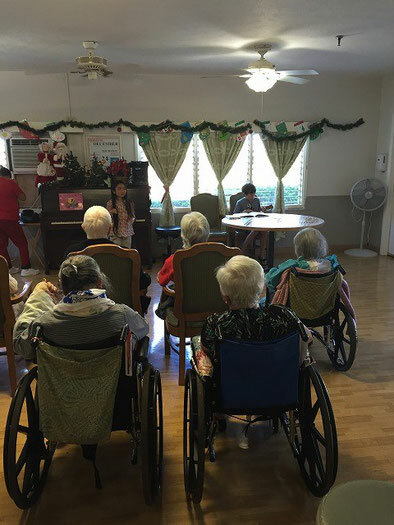 It's been a while since I took my children to the nursing home for entertaining eldery. Before this visitation, my daughter told me she didn't feel like going and she was unwilling to do hula. I understood how she felt. Visitation is not her job but my volunteering work. Not like school, she is not necessary to go. She can be relaxed at home during this winter vacation. It is completely my EGO that I want her to hula. I just asked her to come with me. As my son and I started entertainment after service, I'm glad she changed her mind. She told me that she'd like to do hula! This made me very happy and she said she was happy to see their smiles. selfless kindness can be possible through the strong ego to be kind to others. It is my hope that I can grow my heart of compassion together with growing my children. And I wish you all Merry Christmas!